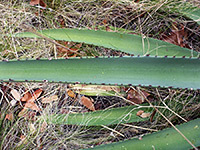 Leaves of agave palmeri are green or bluish green in color, sometimes with light cross-banding, up to 35 inches in length, and point upwards and outwards to create a large plant several feet across. The upper surface of each leaf is flat near the base becoming concave towards the apex, and all the underside is concave. Closely-spaced, red-tipped teeth run along the edges, while at the tip is a reddish-brown spine up to 2 inches long. 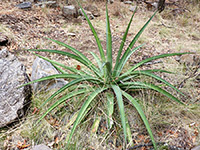 This agave is locally common in some of the ranges of southeast Arizona (east of Tucson), such as the Santa Rita Mountains, Dragoon Mountains and Chiricahua Mountains; it extends a little way into far southwest New Mexico.